BooksPerrini, Francesco (ed.) (2005), The New Social Entrepreneurship: What Awaits Social Entrepreneurial Ventures?, Northampton, MA: Edward Elgar. BooksPetit, Patrick U. (2011), Creating a New Civilization Through Social Entrepreneurship, New Brunswick, NJ: Transaction Publishers. BooksPhan, Phillip H., Jill Kickul, Sohpie Bacq, and Mattias Nordqvist (eds.) 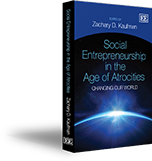 (2014), Theory and Empirical Research in Social Entrepreneurship, Northampton, MA: Edward Elgar.